Subtle but with enough oomph to pack a punch. 1. After applying a base coat to prime your nails (I used Orly Bonder), paint one thin coat of the blue foil, Lumin-icent. 2. 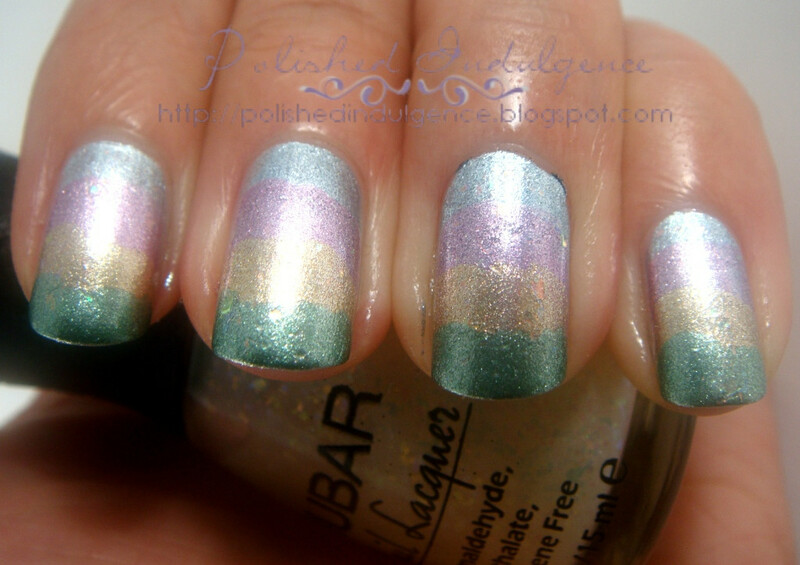 Using the pink foil, Foil Me Once, paint the nails with another thin coat but leaving 1/4 of the blue showing on top. 3. With the gold foil, Luxe, do the same as the pink foil but this time, paint only 1/2 of the nail. 4. 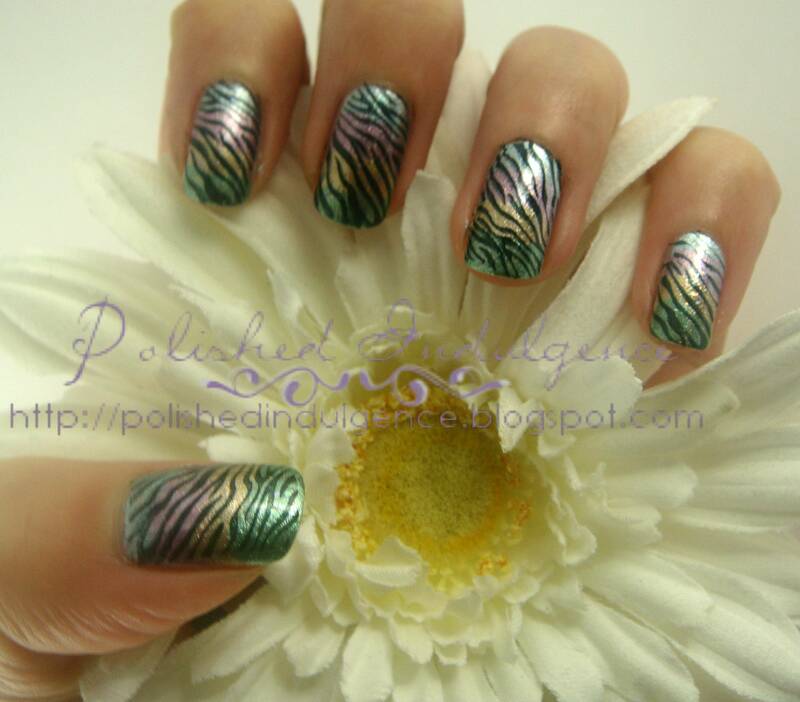 Lastly, layer the green foil, Perfect Mol-ten, and paint another thin layer just on the lower 1/4 part of the nail tips. 5. I added a layer of Nubar Opulent Pearl to add some flakies to the mix but you can barely see them with the shine from the foil finish. This layer is meant to consolidate all the foil layers prior to stamping. 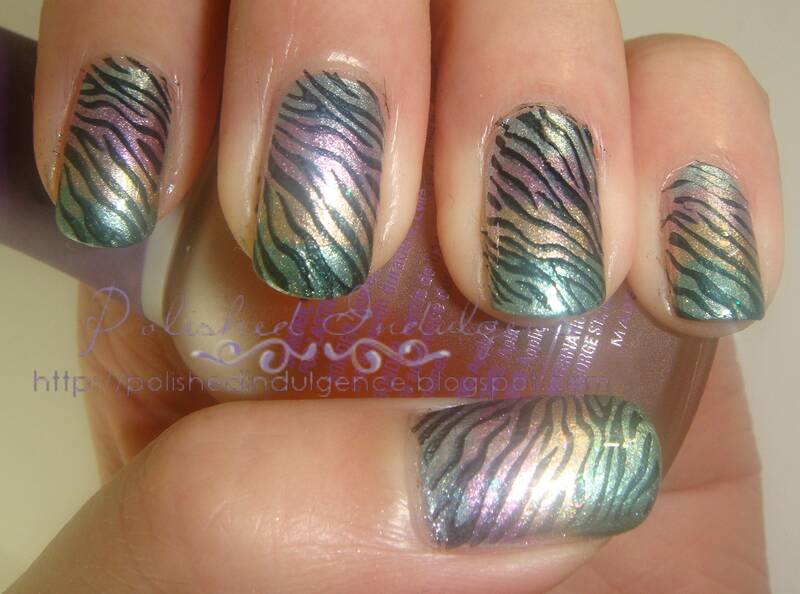 6.Using your black stamping polish, stamp on the zebra pattern from BM plate #223. Don't forget to clean the edges! 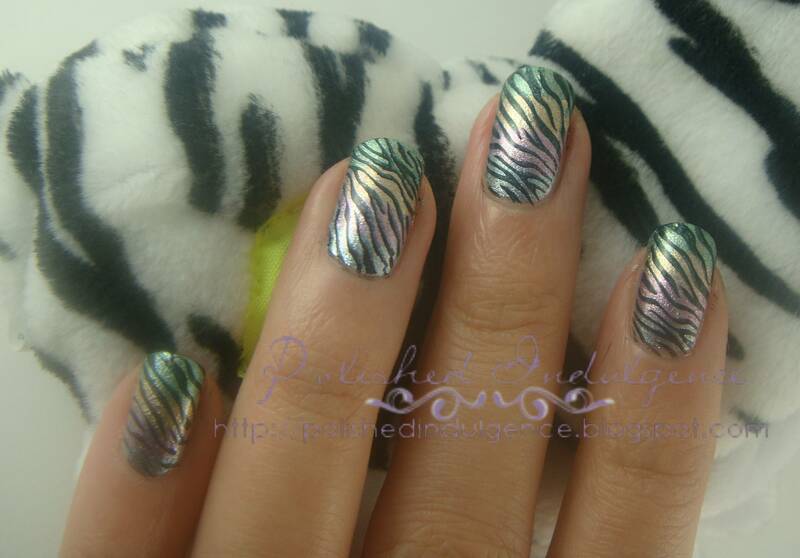 Top it all off with some top coat to seal in the stamped design as well as for extra shine and there you have your rainbow zebra patterned nails! 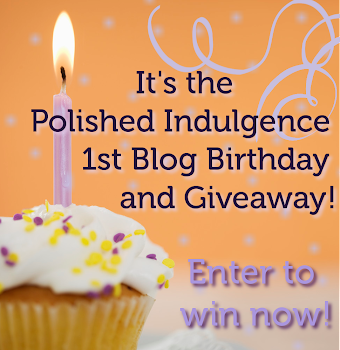 In all its glittery awesomeness. ...so of course I had to pose with it! Green wasn't the best background as the tips blended into it! This turned out to be such a fun manicure! I'm definitely revisiting this next summer. Just imagining all that sparkle and shine under the sun is making me giddy! Hammie asks: Do you prefer subtle or high contrast color combinations? Wouldn't it be cool if there really were rainbow zebras? What's your favorite animal print (please say hamster)? MariJo November 16, 2011 at 9:45 a.m.
Carmela November 16, 2011 at 2:59 p.m.
Swatch And Learn November 16, 2011 at 3:28 p.m.
Carmela, this is my favourite manicure you've ever done! :D Love it so much especially because of the sweet, soft rainbow you did in the background. Great job! Carmela November 16, 2011 at 4:08 p.m.
Anthea Villanueva November 18, 2011 at 9:03 a.m.
That rainbow--it reminds me of my favorite pastel gradients in Photoshop! I'm not a fan of zebra print, but it worked really well here. Carmela November 18, 2011 at 11:51 a.m. I'm glad you like it, Anthea! :) I wasn't sure it was all going to work until I put all the elements together. I took some cues from Lisa Frank (remember Trapper Keepers?) 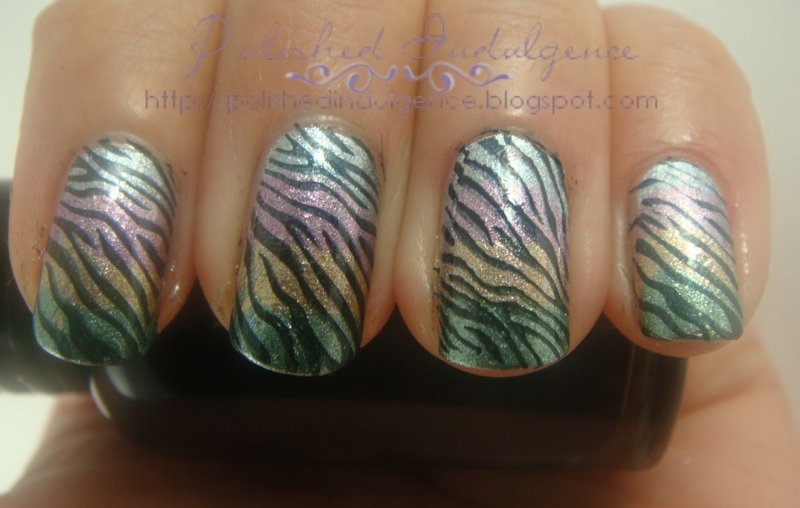 with the rainbow and zebra print but in less subdued hues.